Xavier Hédoire was born in 1968. 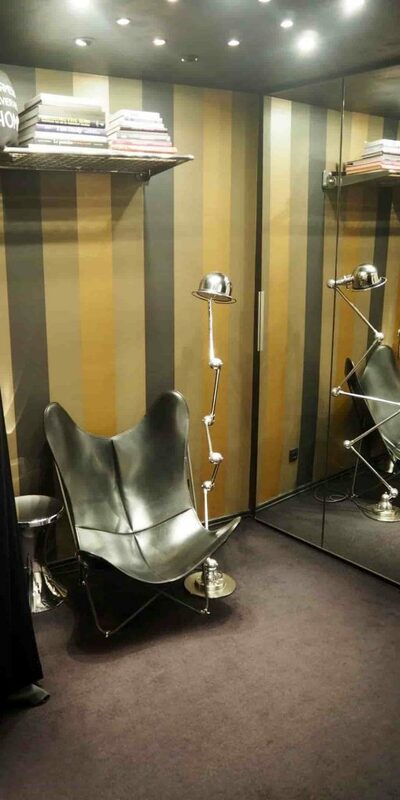 He is a graduated architect and a pattern maker who completed his training by studying fashion design in Paris. 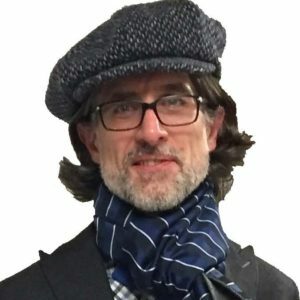 He has worked for a long time in major French industrial groups among their menswear ready-to-wear or made-to-measure departments before creating, eight years ago, his own business. Sincethen he proposes in his own little (work-)shop right in the old center of Strasbourg, custom-made garments and accessories for men. …You can have made at Xavier HEDOIRE’s the accessory or the apparel which you desire, to really and in a unique way, design and finally sign your look. For each of it, you will be proposed not only many different fabrics, most of them Italian or English, but also many options for many different details such as for instance the type of canvas for your jacket (half/ full canvassed front) or the colour and the font for the embroidery of your initials. 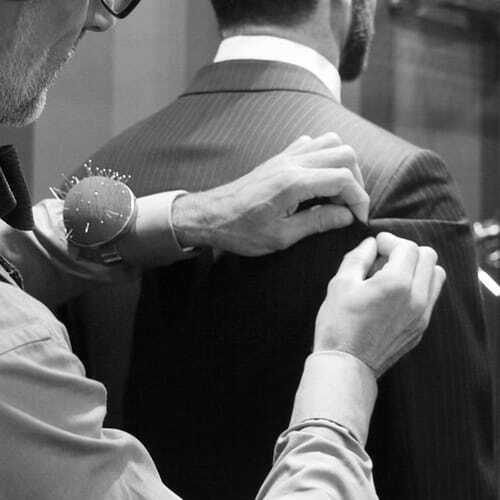 When trying on master garments, all your measurements will be carefully taken by Xavier HEDOIRE himself for your future garment to meet your own expectations regarding ease, fitting and look. 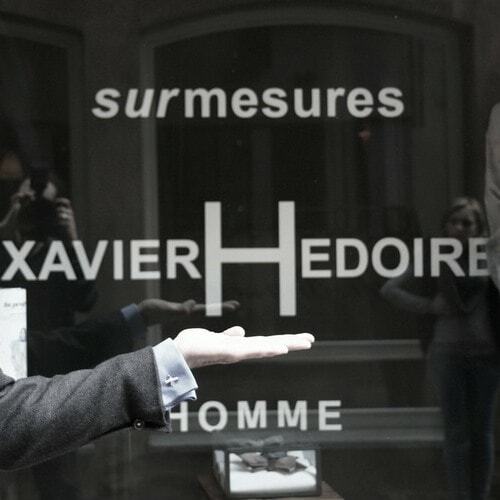 …Xavier HEDOIRE shall meet your expectations by a personalized and sur mesures (custom-made) proposal, more complete and more flexible than simple made-to-measure may allow, and at more affordable prices than those usually applied by bespoke tailors. …Xavier HEDOIRE invites you, would-be groom to come, conceive and get realized your bridegroom dress, completely custom-made. 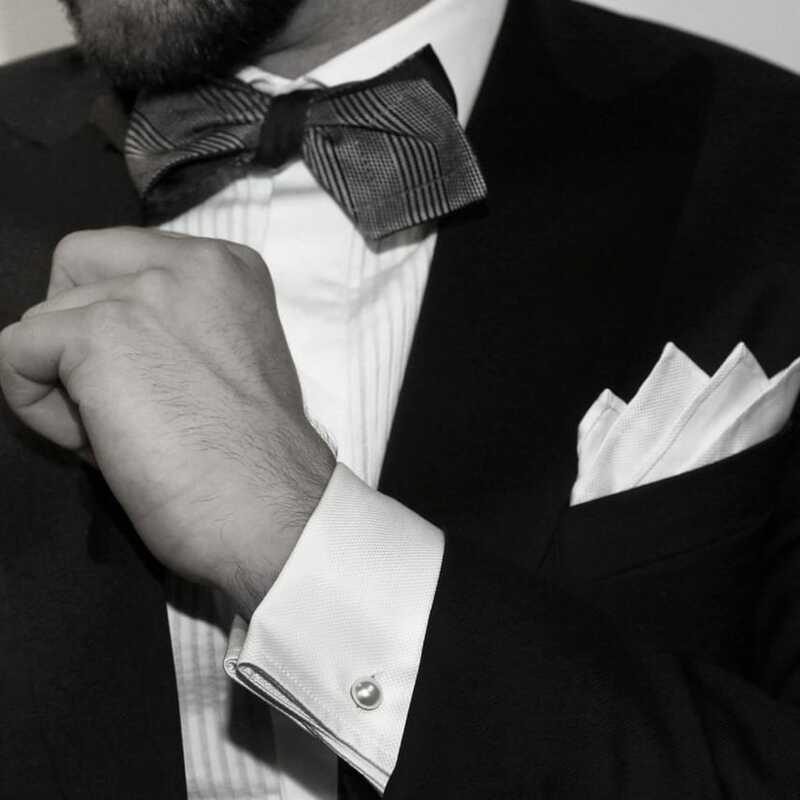 Whatever your style, besides guarantee for impeccable cut, you will be carefully advised by Xavier HEDOIRE to choose the design, the details, the finishes, and of course the materials, among the best ones. Thus, like your predecessors with their tailors, you will be pleased to more renew with the tradition of the wedding. And you will be provided with the unique opportunity to fully live your Great Day, with all the more style, ease and emotion, since your bridegroom attire totally meets your own aspirations and the spirit of your wedding. 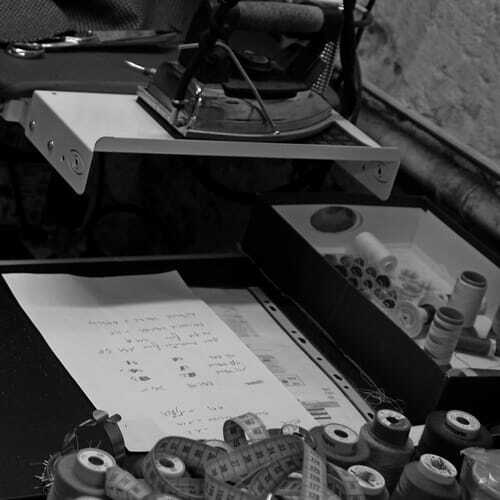 To get your garments realized, Xavier HEDOIRE works in close collaboration with different carefully selected workshops, all of them situated in the European Union. Most of the fabrics are Italian or English. 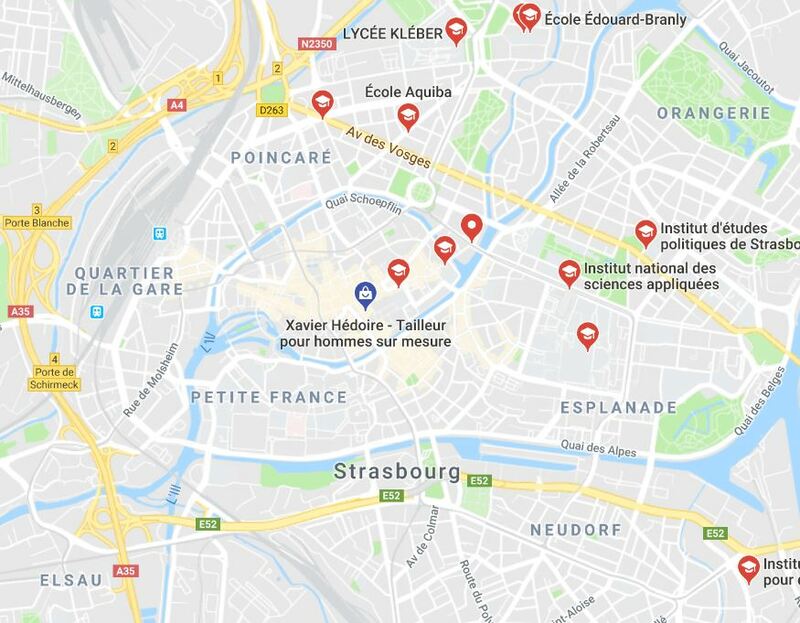 Xavier HEDOIRE has also his own little workshop in Strasbourg, just down to the shop, for him to make himself final adjustments or very special orders. 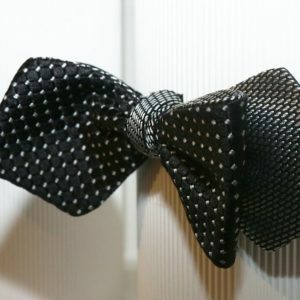 Xavier HEDOIRE is keen on wearing bow-ties and proposes some very original ones in his shop. Most of them are double-face ones, all of them are self-tie ones. 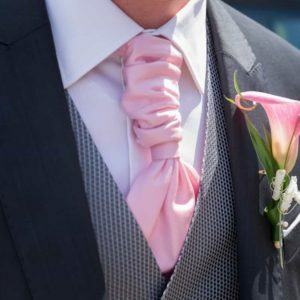 For special requirements, you can also get made your own bow-tie, your tie, your Ascot or your handkerchief in a large range of silk jacquard fabrics. Regarding suits, jackets, waistcoats, coats or shirts Xavier HEDOIRE can propose you many possibilities to personalize of your own garment, such as for example matching or contrasting lining and stitching. 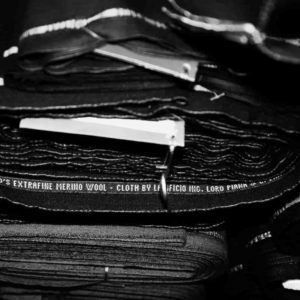 Before you could try on your fully custom-made garment for the first time, you will be asked to wait for about five weeks. Please add some time for eventual requested adjustments. To be sure to get your bridegroom attire in time for the D-Day, with no useless stress, please consider that a delivery date of four months is careful (not taking August into account). 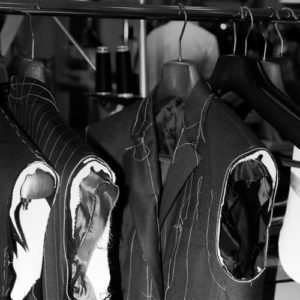 The price of a sur mesures (custom-made) suit or shirt mainly depends on that of the fabric. 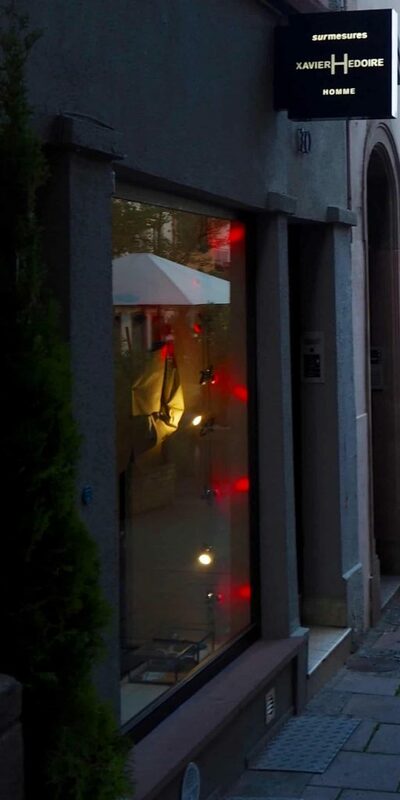 Xavier HEDOIRE welcomes you in his (work-)shop 30 rue du Vieil Hôpital 67000 STRASBOURG, just a bit away from the Cathedral. You will appreciate the chic and cosy atmosphere of the shop, matching carefully chosen vintage furniture and more up to date pieces. 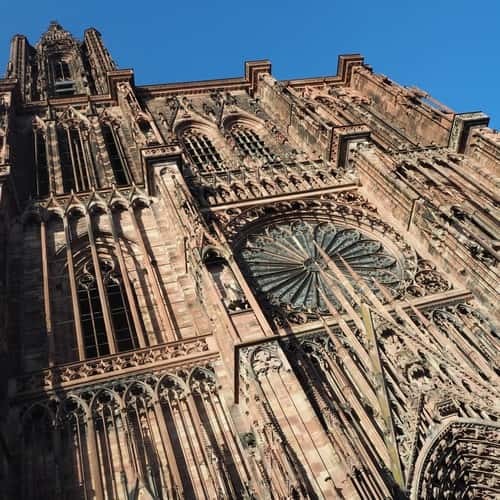 Concours Commerce Design Strasbourg Edition 2012. This web site is the property of the SARL XAVHEDO or of the mentioned rights holders. More information in the French Section.